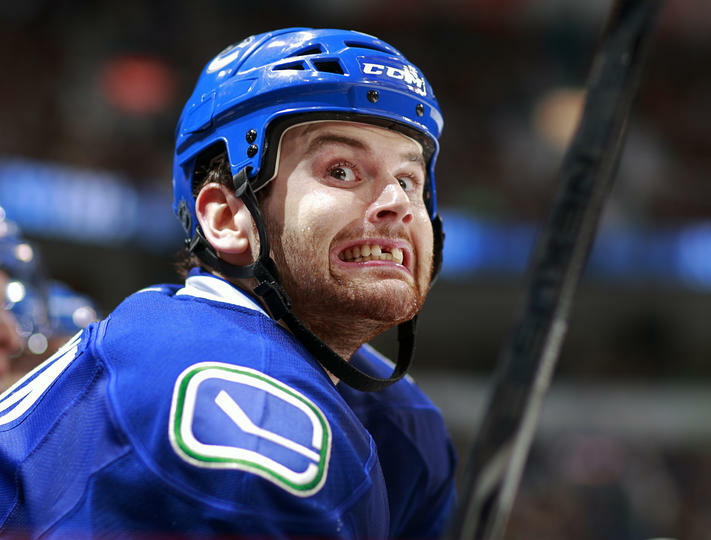 The Sedins and Kesler get plenty of attention, it’s time for Kassian’s closeup. Another home stand has come and gone for the Vancouver Canucks and now it’s back on the road for a 4-game jaunt against 4 of the best teams in the Western Conference. Starting tonight in Phoenix, Arizona, the Canucks (10-5-1, 21 points) look to overtake the Coyotes (10-3-2, 22 points) in the Pacific Division. The Coyotes look to defend their home ice, where they haven’t lost in regulation yet this season (6-0-1). On the other hand, the Canucks take their newly-found confidence and swagger from their game against the Toronto Maple Leafs on Saturday, and their impressive road record, second-best in the NHL (6-2-1), to a building in which they haven’t lost in regulation in four years. Both Roberto Luongo and Mike Smith are candidates to be Team Canada’s goaltender for the 2014 Winter Olympics. Smith has some decent stats: 8-2-2 record, 2.87 GAA (28th in NHL) and a 0.917 save percentage (16th). Luongo has been equally impressive: 8-4-1 record, 2.28 GAA (11th in NHL) and a 0.915% (19th). He also already has 2 shutouts this season, only 2 shutouts back of Patrick Roy on the NHL’s all-time leaders list. The #beastmodo line – or Ry and Ginger line – of Ryan Kesler, Henrik Sedin and Daniel Sedin have combined for 14 goals and 18 assists in the 10 games they have played together. Against the Leafs, they played 2 shifts in the first 2 minutes of the game, built some early momentum, and then scored a rare powerplay goal early in the game. A good start is vital against Phoenix as the Coyotes haven’t lost a game yet this season when leading after the first period. David Booth is recovering from a lower body injury, and the Canucks announced on Monday that he has been assigned to the Utica Comets for a conditioning assignment. When the lower body injury subsides – and this latest wakeup call kicks in – he will hopefully use this stint in the minors to get his act together. Jordan Schroeder is out with a sprained ankle, as are Jannik Hansen (upper body injury) and Dale Weise (lower body injury). The Phoenix Coyotes are not expected to have defenseman David Schlemko available this game with a lower body injury, and have a pair on the injured reserve list, Jeff Halpern and Rostislav Klesla.